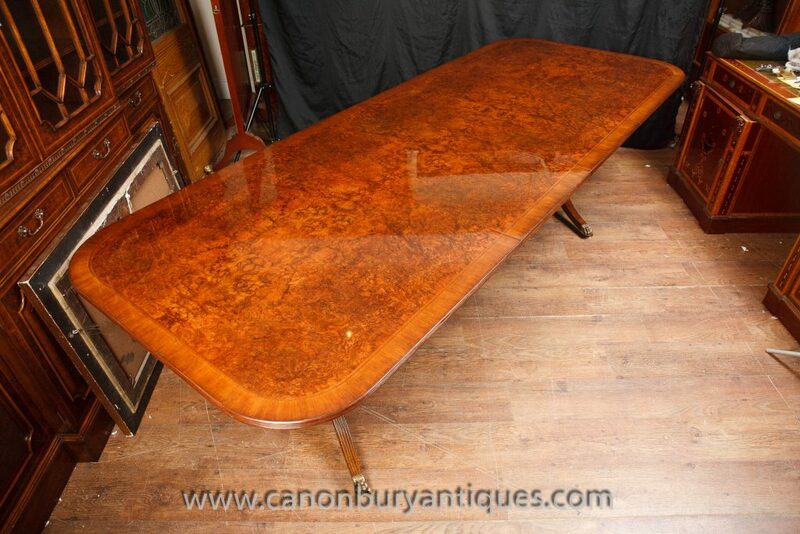 At Canonbury Antiques we carry a range of sumptuous Regency dining tables. The Regency is a classic look for a dining table clean and refined, perfect for contemporary interiors. We have a range of Regency tables in walnut and mahogany so please get in touch. The classic design is the Regency pedestal table with leaves so the table can be made larger or smaller to accomodate the party. We also specialise in matching tables to chairs so if you are looking for a complete dining suite then check out are selection of walnutand mahogany suites. Please come and visit our large Hertfordshire antiques showroom which is packed to the rafters with all manner of goods. In fact, the comment we get most frequently when people first walk through the door is, ‘wow, this really is an Aladdin’s Cave’. We are very well connected by both road and rail. We are a short – 35 minute – drive north of London. We are just off the M25 near the A1 junction just outside of Potters Bar in leafy old Herts. If you are taking the train to our large Hertfordshire antiques showroom, Potters Bar is just 20 minutes north of London Kings Cross via railway. You can either take a mini cab from the station or give us a call and we will pick you up.